Earthbound - Aprilynne Pike - review - Glass @ Way Too Hot Books & Ja čitam, a ti? Review from Ja čitam, a ti? Did you read [b:Wings|5056084|Wings (Wings, #1)|Aprilynne Pike|http://d202m5krfqbpi5.cloudfront.net/books/1327983077s/5056084.jpg|5122699] series by Aprilynne Pike? You did? Than you know exactly what to expect. This author is well known for creating beautiful, magical world that will make you feel like a kid who is discovering worlds of faery tales all over again. Unlike her heroine from Wings series, Tavia is a little bit older - eighteen. I'm guessing that author tried to "escape" image that follows her writing - it seems that general impression among readers is that her books are more appropriate for younger readers. Partly, she managed to to that, but there is still this "feeling of innocence", for the lack of better words. That is not bad thing, quite opposed, it's one of the reasons why I love Aprilynne Pike novels. 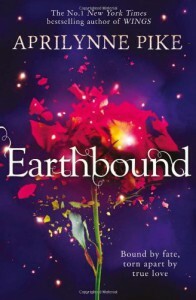 Best way to describe Earthbound would be Ghost Whisperer meets Wings meets Fringe. Best from all three in one package. I have to admit that somewhere around middle of novel I had my doubts about plot and characters, but I'll give you one advice. Keep reading and everything will come to its place. Should you read this book? If you like true young adult paranormal romance, as soon as you can!